Roughly half of American adults aged 30 or older have some form of periodontal disease, according to the Centers for Disease Control and Prevention. In a recent publication of the Journal of International and American Association for Dental Research; “Periodontal disease is an important public health problem in the United States,” stating; “an estimated 47.2 percent or 64.7million American, have mild, moderate or severe periodontitis, or gum disease”! Additionally, it states, the prevalence rates increase to 70.1 percent for adults 65 and older. The data also indicate certain prevalence disparities. Periodontal disease is higher in men than women, 56.4and 38.4 percent respectively, and highest in Mexican-Americans, 66.7 percent, compared to other races. The prevalence rate is 64.2 percent for current smokers, 65.4 percent for adults living below the federal poverty level and66.9 percent for adults with less than a high school education. The survey included for the first time a full-mouth periodontal examination, “making it the most comprehensive survey of oral health ever conducted in the United States,” said an AAP press release. The Academy has been working with the CDC since 2003 to determine the extent, severity and prevalence of periodontal disease. This is the first national probability sample that employed a full-mouth periodontal examination protocol versus partial mouth examinations, the Associations for Dental Research said. The data supported the need for comprehensive periodontal evaluations performed annually by a member of Larrondo Dentistry ’s dental team. Dr. Larrondo and his dental hygienists, Myra and Danielle can complete a comprehensive dental exam designed to identify and prevent periodontal disease. 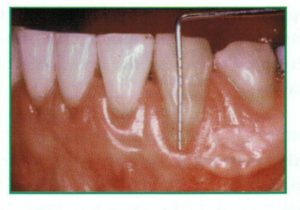 This includes examining every tooth and measuring both attachment loss and probing depth to get the most accurate assessment of periodontal disease. Periodontal disease is associated with age, and as Americans live longer and retain more of their natural teeth, periodontal disease may take on more prominence in the oral health of the U.S. adult population. Maintaining good periodontal health is important to the overall health and well-being of our aging population.